If it's beer you're looking for, Four Peaks Brewery is a nice spot for microbrews. Consistently voted the best brewpub in the Phoenix area. Four Peaks has two locations, Tempe and Scottsdale. They have a good happy hour menu and the food is good. Nothing better than sitting back on a hot summer night with a cold one. My favorite beer is the Hefeweisen and the Kiltlifter. The beer bread sandwiches are excellent and portions are big. Parking is a bit of a challenge but worth it! It's no big secret that nearly all business are down compared to where they were a few years ago, with some more than others. The Myrtle Beach golf courses have actually faired very well compared too many other destinations and other industries for that matter. But lucky for golf enthusiasts they are getting even more aggressive with the "deals" and "specials" passed along to companies like us, Golf Zoo. Recently the Myrtle Beach National Company has taken over management of an increasing number of courses around town. They offer a great "Play 4, Get the 5th Round Free" promo which has been very successful and even more so with the addition of TPC of Myrtle Beach, Wachesaw Plantation East, Tradition Club, Pawley's Plantation, Wild Wing and Blackmoor. Groups now have 15 different courses to choose from with tracks close to any lodging location. This gives them a big advantage over the stand along courses that do not have the ability to offer such great multi play deals. Legends Resorts is another that has been very successful as of late not only offering the "Play 4, Get the 5th Round Free" but also throwing in Breakfast, Lunch and Beer as well. This is especially nice for groups staying in condo properties that do not normally offer breakfast they now get that and more. Another trend that just started this year is "early booking incentives" which give groups special rates and time slots for booking their trips further in advance. With the competition heating up this is a great time to consider Myrtle Beach for your next golf trip. If you want more information on the specials above feel free to give me, Craig Gordon a call at 888.333.6079 as I am here in Myrtle. $100 Merchandise Gift Certificate for Group Leaders! Group Leaders deserve a little something extra this summer! Book your next golf package by August 31, 2010 and the group leader will receive a $100 Gift Certificate to The Golf Warehouse, one of the biggest online golf discount stores! Golf Zoo not only saves you money, time and the hassle of putting the trip together, but we are going to hook you up with a nice gift for yourself. Pick up that new putter you've had your eye on and take more of your buddies' money on the links! Group leaders deserve Pro V1's - not Top-Flites! To qualify for the Gift Certificate you must have a group of 8 or more people and make your deposit on a minimum of a 3 night / 3 round package by August 31, 2010. The Gift Certificate will be emailed to you with your travel vouchers 3 weeks prior to travel. This offer is only valid on new reservations. 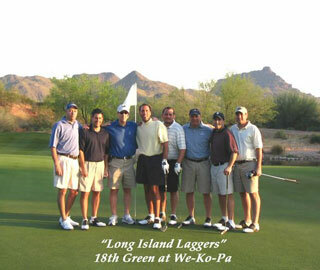 Call one of our expert Golf Vacation Specialists today! To make each round of golf more enjoyable on its three courses, Fazio, Jones and Arthur Hills, Palmetto Dunes offers three unique modes of transportation for getting around the links. The golf carts provide air conditioned comfort for the Summer months and the heated models for the cooler months. Segway Golf Transporters can travel at more than 12 mph and are easy to operate and maneuver. It's a popular alternative for transportation on the green. Whatever type of transportation you choose you will have a enjoyable round on these three World Class courses. I recently had dinner with a large group at Wally's Pub and Grill. 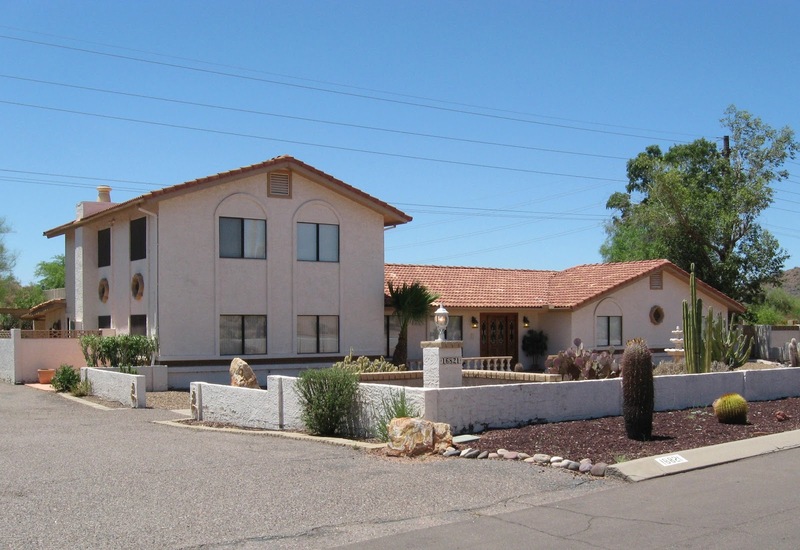 They have two locations; the Scottsdale location is closest to home and very convenient when staying in Scottsdale -it's located in a high end strip center, but don't be fooled by all the glitz that surrounds it. Wally's has a very causal atmosphere and has a lot of regulars at the bar. 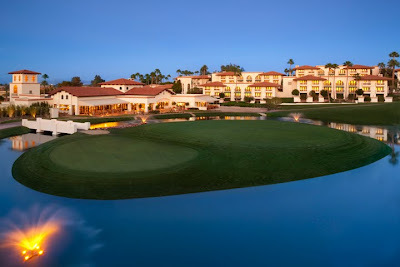 It's mostly a 'mature' crowd (nice way of saying older folks), but keep in mind it's in Gainey Ranch and there's a lot of money in 'dem thar parts! They have a very extensive menu, burgers, sandwiches, pasta's, etc and serve an excellent calamari, nice and crispy. It's served with the traditional marinara sauce, but ask for the mayo sauce, excellent! I've had several dishes, my favorite is the Chicken Vesuvius. My better half always has burgers and sandwiches and he has never been disappointed. Prices are very reasonable and the service is good. Wally's Happy Hour is from 4-6 PM with $1 off cocktails & beer. $2 off all appetizers! Hands down King Kong Sushi is the place to go in Myrtle for the very best rolls. I just had some friends come into town that are pretty picky with the quality and variety that a sushi restaurant offers but they were blown away with King Kong. 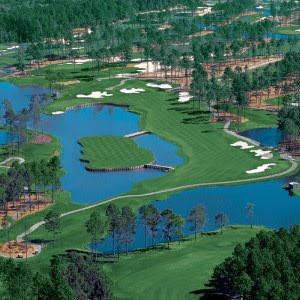 There are two locations- one in Carolina Forrest close to the Legends Golf Resort and another in Broadway at the Beach. With over 100 different specialty rolls to choose from you are sure to find something new or your favorite from back home. If I had to pick my top two rolls I would have to go with the "No Name" and the "Needham" wow are they good. The fish is the freshest in town and the portions are large….well I know where I am headed for dinner now! If your looking for more local advice give one of our knowledgeable sales reps a call at 800.929.7300. Most golfers are afraid to come out West and deal with the high temperatures we get during the summer. Fear not, Golf Zoo has some great unlimited deals this time of year which help your wallet stay cool. You can play some of the best tracks in Scottsdale for a lot less than high season. According to the weather channels, we're expecting a moderate summer with average temps in the low 100's. Get up early, enjoy your rounds, then go back and chill at the pool with a cool cocktail. Don't be afraid, you can do it!! During your Orlando golf vacation, hitting the links is one thing but what to do at night can be just as important - and often overlooked. Are you one of the 3 million golfers who has visited Orlando and wondered where Tiger Woods hangs out? Up until Thanksgiving 2009 when he went into hiding, that answer was Blue Martini, the hippest, coolest, swankiest mall bar in Florida. Rumor has it golf's biggest star frequented the VIP room at this high-end martini bar at Millennia Mall. While a Tiger sighting isn't likely, Blue Martina is still an entertaining bar. It's Orlando's best showcase of people who dress and act like they're at least 10 years younger than they actually are. While the clientele is mostly male, if your foursome is full of cigar aficionados, the Corona Cigar Company is the best bet in Orlando. Once you get past the fact that it's in a strip mall - sadly, more than a few Orlando bars are - you'll be impressed with Corona's wide selection of cigars, including extremely rare vintage, pre-embargo, pre-Castro Cubans. Order a glass of wine and relax the bogeys away. Because you've probably had more success crushing hot dogs than tee shots, perhaps your golf vacation is in need of a health intervention. Okay, well if that sounds boring keep in mind that Season's 52 is not only the healthiest restaurant in Orlando, but also one of the tastiest and liveliest. The seasonally inspired menu is chock full of salads and fresh fish, and every item on the menu contains fewer than 500 calories. The dining area may be a bit formal for your golf foursome, but the large full-service bar is apropos for the social butterflies. In closing, Orlando isn't all about Disney and Universal - it simply is the best place in Florida for a group of golfers to enjoy fantastic golf, great nightlife and fantastic places to eat. Condos? Hotel rooms? Gimme a break. If you have a group of 6-12 golfers and are planning a golf trip to Scottsdale this year, stay somewhere truly memorable in one of our three Ultimate Private Golf Homes in Fountain Hills, just east of Scottsdale. They are different than any private homes you've ever stayed in on a golf trip. Period. We opened our first home, The Estate, four years ago, and it became so popular that our owners have since purchased and Lori and I outfitted two more - The Oasis, and most recently, The Clubhouse. 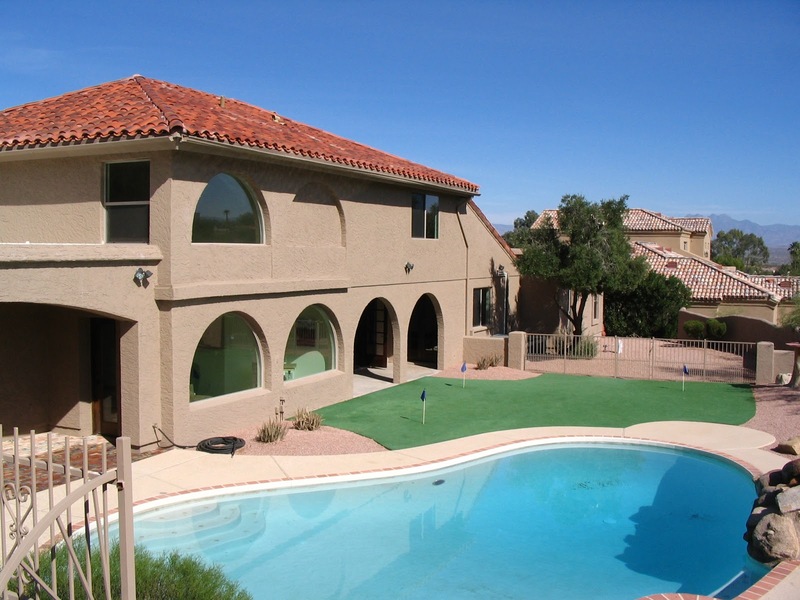 These homes were purchased and designed with certain things in mind - give larger groups of golfers something luxurious, convenient, affordable, and loaded with the amenities or "goodies" that make a golf trip a spectacular event. The Estate is a Five-bedroom, Two-story home just off Shea Blvd. and is the most "open" floor plan of the three. Upstairs is the kitchen, living room with a 52" big screen TV, poker room, and Two bedrooms, but you'll spend most of your time on the elevated back deck, which is literally built into the side of a mountain, with a huge desert wash behind. The dramatic desert views off the large back deck is the signature feature of The Estate. The back patio - complete with a propane grill - is the perfect spot for grilling steaks, having a cocktail, and puffing a cigar. The pool has a waterfall, and it's great to sit in the jacuzzi overlooking the desert wash. Downstairs you have another 50" big-screen TV just off the pool table room plus three more bedrooms. This home is unique in that it has two separate garages, so we put a Ping Pong table in the downstairs garage leading out to the pool and jacuzzi. The Oasis is a six-bedroom, two-story home just off Shea and Saguro and is the largest property of the three. Also, two of the three bedrooms upstairs are configured with one bed only, so if you have snorers, you can lock them away in their own rooms. The best feature of The Oasis is the backyard. It has a huge pool, an observation deck with table and chairs over the jacuzzi, which is perfect for cards, cigars, etc, as well as a brand-new 900 square foot putting green, horseshoe pit, and basketball court. The Oasis sports a 52" big-screen TV in the living room as well as smaller TVs all throughout the house. 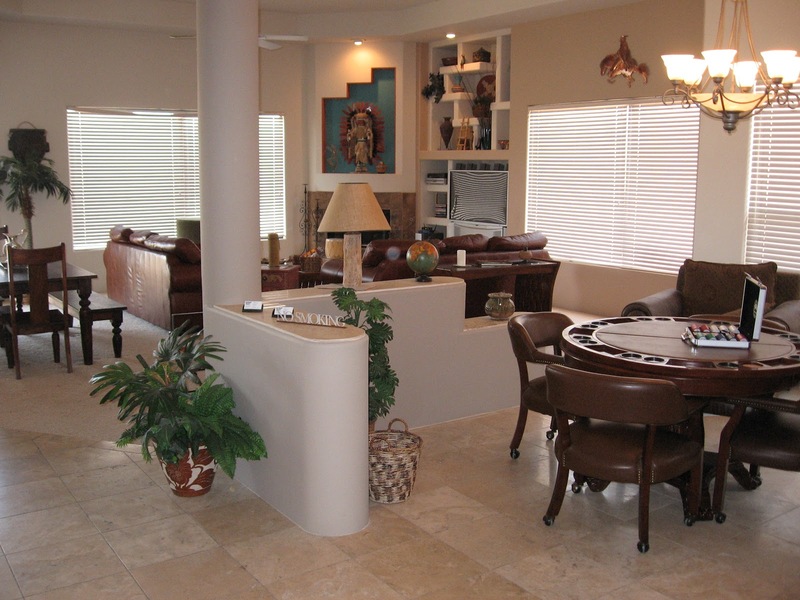 The pool table room is huge, with both a professional pool table and poker table in the corner. The Ping Pong table on the back patio poolside make this the best backyard of the three properties. All three of these properties are priced the same and are much more affordable than you would think. In peak season (January - April) it will cost between $75 - $125 per golfer per day, and in off-season will be as little as $50.00 per golfer per day. When you look at the average price of any resort (minimum $200 per night in season for a double-occupancy hotel room), it's a total no-brainer. Call Chris Parcell (888.867.6911), Lori Greene (888.867.6921), or Marcus Blake (888.985.9166) in our Scottsdale offices for more information and we will get you a full itinerary with pricing. Barton Creek - Texas #1 Golf Resort! I had forgotten about the topography of the Hill Country. Driving down Bee Caves Road reminded me alot of Fountain Hills, here in east Scottsdale. Windy roads let to the hilltop resort which you could see for miles in the distance. Valet parking and check in at Barton Creek was fast, efficient, and pleasant. The bellman had my bags at my "Resort Guest Room" in a matter of 5 minutes which was a nice surprise, as I find you often wait 20 minutes at some full service resorts. They also had a fresh ice bucket waiting for me. How do they do that? The "Resort Guest Room" at Barton Creek is spacious, very nicely decorated, and has all the amenities you would want - my room was facing the back of the resort, and had a small balcony with a truly incredible view of the pool area, #18 on the Fazio Foothills course, and the rolling countryside of Barton Creek. Went down to the lobby bar "Jim Bob's" and had a late dinner - very cozy little dark bar with a decent menu at 10:00 pm. 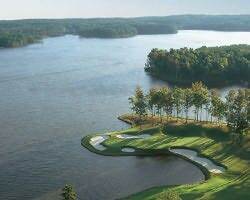 First up was the Palmer Lakeside Course, about a 25 minute drive from the resort. Built in 1986 by the King, I enjoyed the fact that the fairways were fairly generous, and the rough was mowed relatively short - this seemed to be the most forgiving of the four courses, and had some of the best par 3's. The most dramatic hole was #11, a 201 yard par 3 with a huge waterfall in the background. Terrific views of Lake Travis and mesquite tree lined fairways make this the perfect start to your weekend. Nice job Arnie. The afternoon round was onsite at the resort on the Crenshaw Cliffside course. #1, a short par 4 of 358 had a great view of the resort from the fairway, and resulted in a rare birdie. I always liked Ben. #10, a brutal, skinny par 4 of 455 yards produced a double bogey. I never liked that Crenshaw guy. I thought the back nine was certainly more dramatic than the front, and the #17 142 yard par 3 was stunning - downhill and downwind was a great way to finish. Back nine was really, really great stuff. Next up was the Fazio Canyon's course on Friday morning. 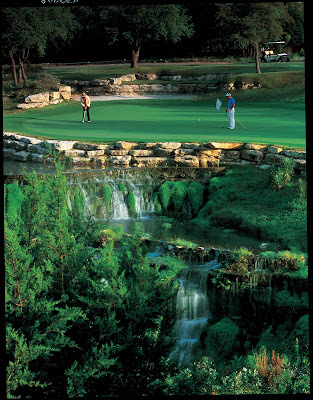 The Canyon's course is typically rated just behind the Fazio Foothills course on most rankings, but I thought the Canyon's was clearly the best of the four at Barton Creek. Surrounded it seemed like on all sides by hilltop mansions, it was visually stunning from start to finish. The approach shot on the par 5 #10 hole reminded me alot of the approach shot on We-Ko-Pa's famed #8, and dramatic elevation changes from tee to greens in my mind made this the clear winner. I thought just about every hole was a "signature hole" - fantastic. The 18th hole, a downhill par 5 I thought was the most dramatic hole. This course would be in my all time Top 5. In a word? Wow. Last up was the #1 ranked Fazio Foothills course. I should have quit while I was ahead. The architect boasts on his website that it "puts a premium on long, accurate drives down the hybrid TIFsport bermuda fairways, and small undulating TIFFeagle greens makes this a shotmakers paradise." Being a 14 handicapper, long accurate drives and shotmaking are not my specialty. Although I managed to put up a pathetic 97, the Foothills course was clearly the best option for a golfer that could hit driver / 3 irons all day and be happy. #10 a 424 yard par 4 is an awesome start to an incredible back nine, with 3 of the best finishing holes anywhere. In two words??? Look out. Fazio Canyons - Dramatic elevation changes and scenery made this #1. Fazio Foothills - 3 of the best finishing holes anywhere, and brutal - bring a dozen Pro V-1's. Palmer Lakeside - Easy and breezy. Great views of Lake Travis. Crenshaw Cliffside - Front nine? O.K. Back nine? Phenomenal. If you're thinking about an Austin Stay and Play, Barton Creek is world class. Don't bother going anywhere else. Click here to view our Austin / Barton Creek page This includes everything, even the gratuity at the restaurant. For you die-hards, I can also pre-book replays at Crenshaw or Palmer for $30.00! Call Chris Parcell at 888.867.6911, and I can customize an itinerary for you! P.S. Don't mess with Texas. It's cold. You're sick of it. I get it. Wait a couple more weeks, and come to Scottsdale in mid April or May. The weather is still absolutely perfect (mid 80's, no humidity, and no rain), and the prices are much more reasonable. We have put together a stay and play package for Scottsdale that is First Class all the way, but won't have you dreading your next Amex statement. 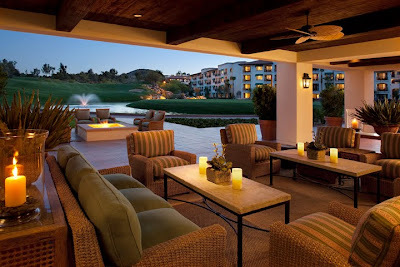 Arizona Grand Golf Club - On site at the resort, and perfect setup for day of arrival play. SunRidge Canyon Gold Club - Rated #42 on Golf Digest "Top 100 You Can Play"
More info on each course can be found here. This stay and play package is valid from April 11th through May 31st, and at $199 per person per day which includes the suite, resort fees, green fees, and all taxes, it's a spectacular value! Feel free to contact Chris Parcell or Lori Greene in our Scottsdale offices for more details.